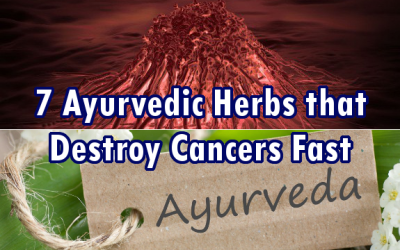 Numerous Ayurvedic texts speak of ways to treat cancers of the colon and digestive system. Two texts which were written around 700 BC are classic wisdom from the sister science of yoga – the Charakaand Sushruta Samhita. Both are suggested as being an imbalance in one of the doshas (Vata, Pitta, Kapha) which describe general physiological states in people throughout the world. Once the doshas are returned to balance, then cancer and other diseases disappear from the body. The following 7 herbs are used in Ayurveda to bring balance to the doshas, helping to minimize or completely eradicate colon cancer. Due to being an adaptogen, this herb is used for literally hundreds of ailments in Ayurvedic medicine. It ‘intuits’ where your body needs support and provides it. Ashwagandha increases our resistance to stress while increasing energy levels, freeing up the body’s systems to scavenge rouge cells. According to research conducted on the herb, ashwagandha helps in the slowing down of the growth of the cancer cells and inhibits the growth of tumor cells without harming the good cells. Numerous double-blind studies have shown that garlic is a powerful herb for treating cancer. Naturopaths have been using raw garlic, and even garlic juice or soups, to treat cancer for ages. Garlic has even proven to kill brain cancer cells (in addition to colon cancers) without harming healthy cells, and with no side effects. Add some onions and broccoli, and you’ve got a cancer fighting power-house. It is also a staple of the Ayurvedic herbal medicine cabinet. Check out the health benefits of garlic, here. Green tea isn’t just a social grace, but a healing remedy for colon and other cancers. Not only does it inhibit the formation of cancerous cells, but the catechin polyphenols within can even kill cancerous cells without harming healthy cells. By drinking green tea regularly, you can eradicate colon tumors while they are in their most infant stages. A member of the poppy plant family, celandine has been known to treat colon cancer as well. It also boosts the immune system so that cancer and other disease never have a chance to develop. Further, the herb treats diseases like asthma and atherosclerosis. While these two herbal remedies act together primarily as a means to cleanse the colon, thereby eliminating toxins which could accumulate in the digestive tract causing disease, they are also great anti-inflammatory agents. The benefits of Apple Cider Vinegar (ACV) cannot be understated. It helps with candida overgrowth (also shown to contribute to many cancers) and lowers blood glucose levels. Aloe Vera juice has been shown to help people who have tried numerous pharmaceutical meds – folfox, xeloda, avastin and other chemotherapies to no avail. An Ayurvedic staple, ginger is used in many Indian dishes. Inflammation markers that have been earlier proved in clinical research as precursors to colon cancer can be reduced significantly by the consumption of ginger powder or ginger roots. A powerful anti-inflammatory, ginger soothes and heals the digestive tract, and therefore has been suggested as one of the best home remedies for the treatment of colon cancer. Ginger has also destroyed ovarian and prostate cancer cells in other studies. If you haven’t heard of this herb by now, you’ve likely been living under a rock. The compounds in Turmeric can heal just about anything. Curcumins found in turmeric roots cause colon cancer cells to self-destruct. Astounding results were found when testing turmeric’s ability to destroy cancer cells at the Department of Surgery, Dalhousie University, Halifax, Nova Scotia, Canada. Sure, you can turn to chemotherapy for your colon cancer, which causes your hair to fall out, your insides to feel like they won’t stop being regurgitated, and your energy to be completely devastated. You can also try invasive surgery – all for the bargain basement price of several to twenty thousand dollars. Or you can start taking these Ayurvedic herbal remedies that have been around for thousands of years and proven through time for mere pennies. What herbs would you take for Bowel Cancer? Nothing you have written above is actual ayurveda nor how any of those herbs are used in ayurveda, specially with colon cancer which would need to be looked at from the individual’s imbalance and the type of colon cancer it is. Simply put, your limited knowledge of ayurveda and your arrogance of writing an article is harming people rather than helping them. But I guess you don’t know that. You have simply written just one more bogus ayurveda article out there on the internet and whats even worse is that your writing about cancer, so your really messing with the seriously diseased and full of fear and anxiety. Deep deep shame on you. What’s your take on this. Your recommendations for this ailment so people can benefit. Thanks. Hi Kingsley. Not my take. Actual Ayurveda does not work as an allopathic paradigm works. It doesn’t work as western herbalism, which is in the same paradigm as western allopathy is. Hard to wrap one’s head around with a western mind. Ayurveda treats the individual. Not treating symptoms of the disease. How treatments for the same disease in two individuals would be carried out would be possibly drastically different. What is written above is a westerner taking a book on Ayurvedic herbs and seeing what Ayurveda would use possibly for cancer. Its actually not correct or Ayurveda. Cancers are all different. Different tissues involved. Herbs have affinities to different tissues. A disease in Ayurveda, is categorized by one method and then under that umbrella that imbalance is further delineated in its different ways, each needing its specific treatment. Unfortunately much of what your going to find out there on Ayurveda is a Westernized idea of it with this article being at the worst of the heap and scientific research being done from a western approach being at the upper level. Western research methods can not be used on Ayurveda because Ayurveda is basically and inverse way of seeing everything. If you take an herb, what the individuals basis is will have an impact on how that herb functions in their system, this could be good or bad. What you take that herb with matters greatly as to how and where that herb will take its effect. What time you take that herb also will greatly impact its effect. Ayurveda is actually way way more detailed a science than Western medicine. Hard to swallow fact. But, with the popularization of Ayurveda in the West, it has also been watered down to the point where you will not find real Ayurveda easily. If your needing real treatment, the only real option is India and then finding the real thing there…. its difficult as well. If you are searching, i would advise to stay away from the popular by the Western crowd places. Stick to the reknown places like AVP. Even then it is kinda a hit or miss. good luck. Thanks Brad for the enlightenment. But can one combine 4 or 5 of the suggested herbs and achieve some results? Also, can you, or anyone knowledgeable on this subject, please recommend a combination of herbs, Ayurvedic or not, that has significant impact in killing colon cancer cells? i am simati from south africa have been suffering from (HIV/AIDS) disease for the last four years and had constant pain, especially in my knees. During the first year,I had faith in God that i would be healed someday.This disease has been trying to circulate all over my body and i have been taking treatment from my doctor, few weeks ago i came on search on the internet if i could get any information concerning the prevention of this disease, on my search i saw a testimony of someone who has been healed from (Cancer) by this Man Dr PRINCEARATA and many other`s. well she gave the email address of this man and advise we should contact him for any sickness that he would be of help, so i wrote to Dr PRINCEARATA telling him about my (HIV Virus) he told me not to worry that i was going to be cured!! hmm i never believed it,, well after all the procedures and remedy given to me by this man few weeks later i started experiencing changes all over me, and suddenly after some time i was finally healed, friends i will advise if you have any sickness at all you can email Dr PRINCEARATA on : ([email protected]) or call him on +2348163241499 sir i am indeed grateful for the help i will forever recommend you to the world. Chistina sarich …..My mother is having recurrant adrenocortical carcinoma which is a deadly cancer. Due to which she is having high cortisol…..Due to high cortisol ,she is not a candidate for curcumin and few more herbs you have mentioned…..Can you let me know the specific herb that would be good for her. pelvi scan report ..real time B mode of ultrasonography of the pelvis done..there is an uniocular cyst with clear fluid of 46 x 56 cm in right ovary..left normal..there is no mass or fluid oncollection in pod…uterus anteverted it measures 8.4 x 5.2×6.3 mm..endometrium myometrial junction is ill defined…uniocular right ovarian cyst with risk ofmalignancy is 0.6 %..endometrium measures 7.3 mm….pl provide suitable medicine age 32 yr. regards. Cangard Anti-Oxidant and Cangard Recovery Fast is an evidence based CAM (Complementary Alternative Medicine) treatment modality designed for concurrent and adjuvant cancer care. It is introduced with an aim to offer relief to cancer patients without interfering with conventional cancer therapy. What about the part where India consumes more of these things than any other nation on Earth, yet has a higher incidence of cancer than any other country on Earth? Hummmm… Makes no sense. Where are the statistics to back up your statements? Yes, a disinformation agent would make this statement. Pesticides are the cause of cancer …. some countries still use DDT on their crops, and Monsanto round up type of pesticides and GMO products from the same company. India is also, unfortunately, very polluted right now and not everyone can afford these herbs since there are very many poor people in India who can barely afford basic foods. With some of these substances (curcumin) they have done experiments and shown that yes, it kills cancer cells in the lab. That’s not a perfect translation for what happens in the human body, of course, but OTOH the side effects from taking a teaspoon of curcumin and ashwagandha, a couple of cloves of garlic, a swig of ACV and a few cups of green tea a day are pretty minor compared to the side effects of chemo. I’m not saying people shouldn’t do chemo, either. But a lot of times even the doctor will tell you that chemo will only extend your life a year or two, and then you have to ask yourself – is it worth it to spend 6 months in a lot of misery and then continue to deal with the side effects for another year for a little extra time vs. being relatively comfortable, able to travel and enjoy your loved ones, etc.? If you decide to do chemo, adding herbs and so on might help with the side effects. If you decide not to do it, the herbs might extend your life or at the very least make the time you have left better. That’s a non-trivial benefit. Add in black cumin and you have a winner.